My new collection of Limited Edition ornaments are hand made by me from polymer clay, This particular ornament is part of my Petey collection. 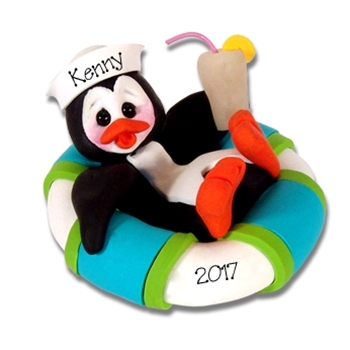 In this ornament, Petey Penguin is leisurely floating around in the pool with his lemonade. This is probably one of my favorite ornaments. It comes complete with a hook and satin ribbon for hanging.